At my ranch, we have a wonderful sound system in the movie room below my bedroom, one with speakers so plentiful and effective and with such notable bass that my bed rumbles apace with the action. And then, I needed coffee and oatmeal with chia. And then, I exchanged a series of personal emails and calls, all before I drove home from my ranch with my son. It was a pleasant drive with not a muse in sight. I was happy. Muse free. Mind meandering across pleasant thoughts of night swims and pools of consciousness, the singing of muses the farthest thing from me. But, when I got home, she found me. 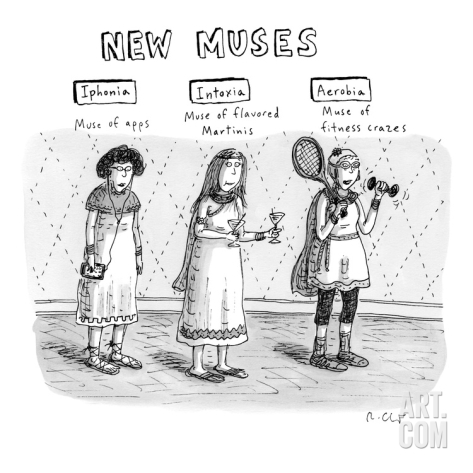 Disciplinia, the new muse in town. She shoved aside Iphonia and her fixation with my Facebook app. She reminded me Intoxia is making me fat. She told me Aerobia was friend enough to wait. And I sat in my place at the table, ignoring the wind and the darkening sky, and I wrote my words for my novel and then, this blogpost, and now that it’s 9:09 p.m. California time, time to swim and leave all thought behind. Procrastinatia, and Distractioneoni are my biggest muses.